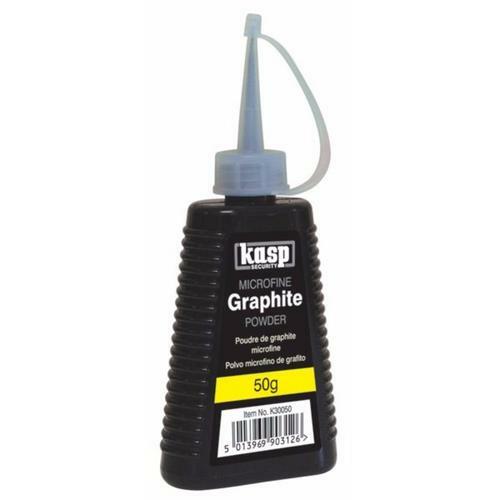 The Kasp K30050 Microfine Graphite Powder is ideal for Lubricating and Freeing up Car Doors, Padlocks, Cylinder Door Locks and moving Parts. The Best Lubricant for all types of locks including car door locks and outside padlocks as being dry it cannot freeze. Long Lasting and for Smooth Lock Operation. Dry, Microfine, Greaseless and Odourless Lubricating Powder. Supplied in a 50g dispenser with a fine dispensing spout for ease of use. Excellent value, delivered promptly. Now my front door lock works as it should. I had an Avocet ABS lock where the magnetic pins were starting to lock up. Any liquid lubricant like WD40 would ruin the lock so ordered this. A quick single squirt of graphite powder followed by inserting/removing the key a few times and it's as smooth as the day I first got it! Just make sure you wipe your key after using the lock the first few times as the powder can stick to it. Used this for our new front door and also a bathroom privacy lock. Lubricated both and made their movement easier without doing any damage to the lock mechanism. Graphite does not stick to dust/dirt like oil would, so will not clog up the lock over time. It is unlike WD40, which does free-up locks fine, but contains insufficient lubrication so the lock sticks again quite soon afterwards. Brilliant fast service, ordered graphite powder for electric door locks and instant improvement. Easy to order. Arrived quickly. Does exactly what it says. My lock has been sticking for ages. Oil would not work. Graphite made an immediate difference. All my locks now work perfectly.